Shipping times do not reflect 1-3 business days that we need to process an order. AtoZEyewear.com welcomes International orders only after a customer read and agreed to our shipping policies described below. AtoZeyewear.com reserves the right to cancel, hold, or decline any order we deem suspect without notification. AtoZeyewear.com will not be held responsible for any foreign fees incurred and said fees will be the sole responsibility of the purchaser. These fees could include, but are not limited to duties, import fees, excise taxes, etc. Please contact your local customs office for details. In addition any packages confiscated, destroyed, or held by customs is also the responsibility of the customer. If for any reason the package is seized by Customs Officials, we will not issue you a refund unless all the products are returned to us in their original conditions. If the package is returned to us by Customs Officials you are still responsible for the shipping and restocking fee charges. 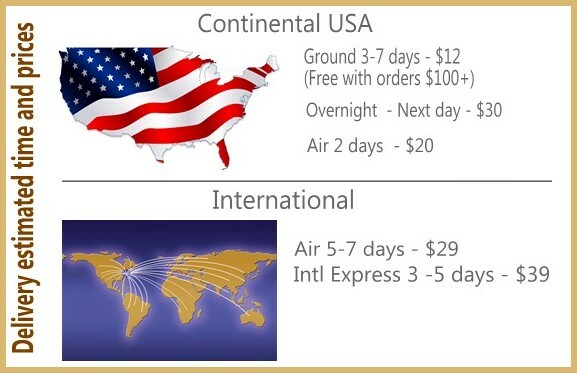 We use USPS (United State Postal Service)* priority mail international, the least expensive air method. It usually takes 3 days to 2 weeks, but could take 30 days if held by your local customs. Priority mail does not offer tracking. We will email you the Tracking number the next day after your order is shipped. * Occasionally we could ship your order using other carriers such as UPS, FEDEX and DHl. We consider your Shipping Payment as your approval of the policies described above.